Are you are a beginner artist and looking to add some depth to your drawings? One point perspective is an important first step to making parts of your drawing look 3D. 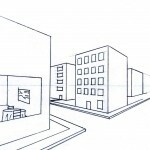 This page is VERY LONG and includes many one point perspective tutorials. The lessons start off easy and progressively get more advanced. Much of the lessons here are sequential. This means the knowledge in each perspective lesson builds upon the previous lessons. Feel free to skip around using the table of contents, but If something seems unclear, you most likely need to complete the previous drawing exercise(s). You should actually draw out each exercise, not just skim the page. Perspective drawing gets very technical and needs to be drawn repeatedly to become part of your permanent skill set. Honestly, there is way too much information to digest in one reading. Bookmark this page so you don’t forget it. Just make sure you understand the basics before attempting to draw the more complicated subjects towards the end of the page! One Point Perspective is a type of linear perspective that uses a single vanishing point to create the illusion of depth in a work of art. There are several methods of linear perspective, but one-point is a single point perspective and is the simplests. One point perspective assumes the flat, facing planes of objects have no depth but the sides and edges leading away from the viewer have depth. The artist need only decide the vertical and horizontal measurements of each form and connect them to a single vanishing point. This will create an illusion of depth on paper. 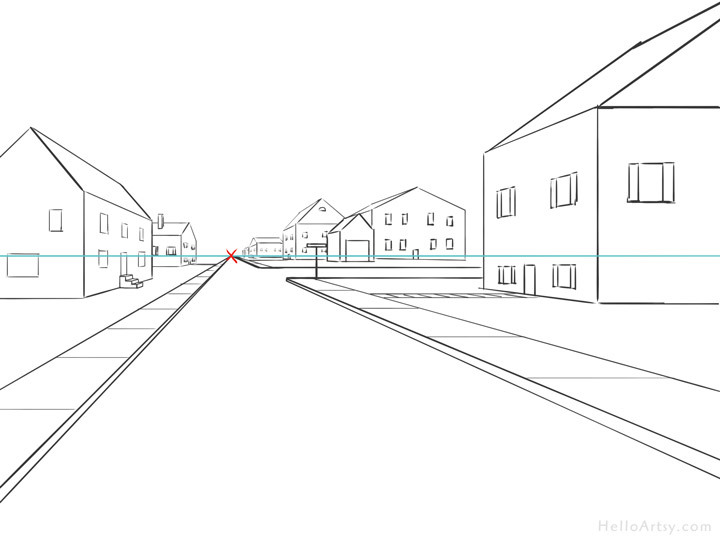 While difficult to discuss in words a few simple one point perspective examples will make this drawing process super easy! 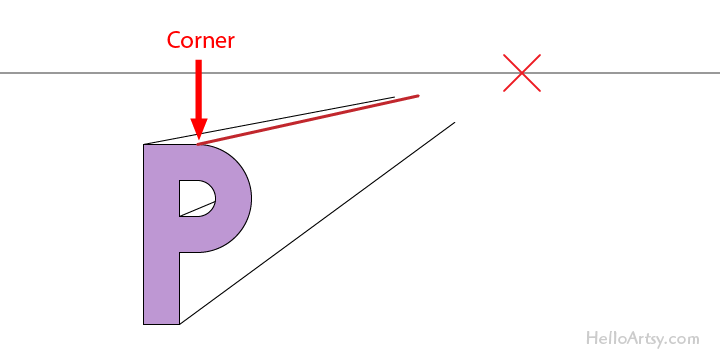 There are several lines and components that show up frequently in a 1-point perspective drawing. It’s a good idea to get familiar with them. Here’s a list of useful vocabulary that is frequently used when describing a one point perspective drawing. Parallel – Parallel lines are lines that never touch… even if they are extended indefinitely. 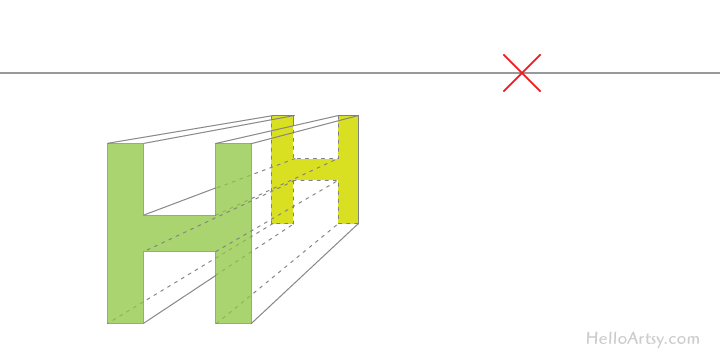 Horizontal Lines – Lines drawn from side to side level with the horizon. Horizontal lines will be parallel the top and bottom edges of your paper. 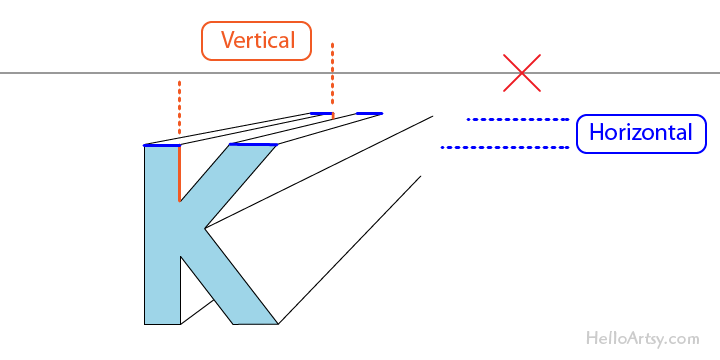 Vertical Lines – Lines drawn up and down and perpendicular (right-angled) to the horizon. Vertical lines should be parallel to the sides of your paper. I’m always surprised at how many young students don’t know what a vertical or horizontal line is. 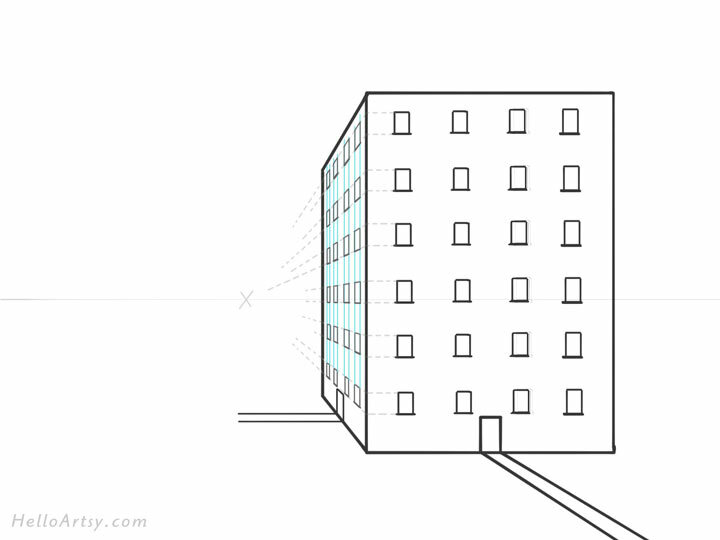 In a one point perspective illustration you will draw a ton of vertical lines and horizontal lines. Make sure all the vertical lines are upright and parallel to each other. Make sure each horizontal line is sideways and parallel to each other. Slanted Lines – Lines that are neither vertical nor horizontal; slanted lines are diagonal. 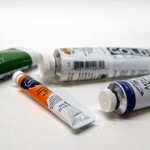 Horizon Line – The horizon line is a special horizontal line that represents eye level to the viewer. Most of the time he horizon line will be imaginary so while you should include it you should draw it lightly so it can be erased or drawn over later on. 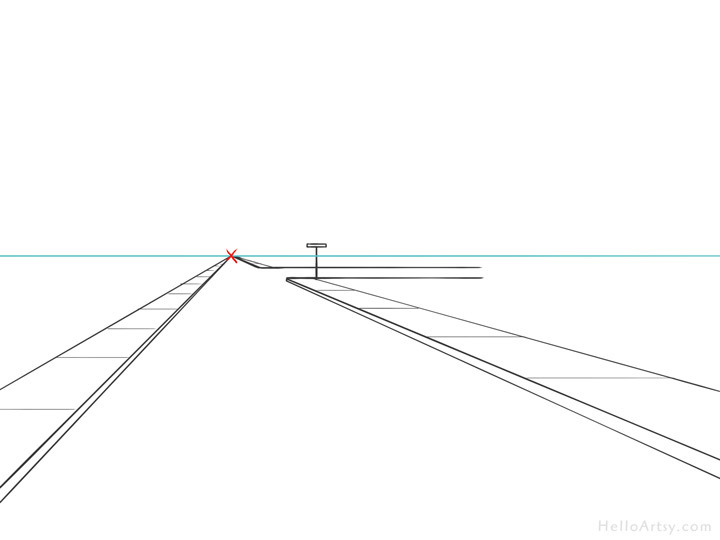 Vanishing Point – A point on the horizon line where all perspective lines meet. The vanishing point exists on the horizon line. Note: it doesn’t have to be in the middle of the paper. 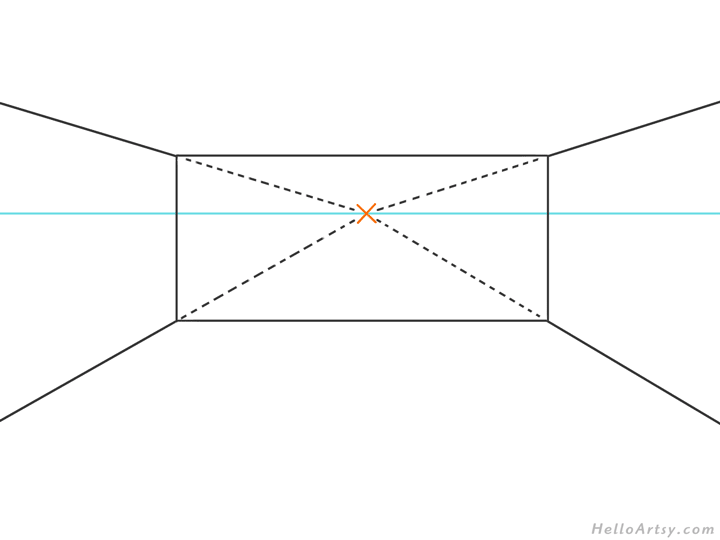 Perspective Lines (orthogonal lines) – The lines that meet at the vanishing point. Perspective lines are parallel in real life but converge in a one point perspective drawing. Plane – A plane is a flat, two-dimensional surface with no thickness. A cube, for instance, has 6 planes. Form – A form is a 3-D object, it contains volume and three dimensions. The one point perspective method of drawing is best suitable for drawing box-like objects. Although an experienced artist can use perspective drawing to replicate complicated objects, it’s best to start off simple. Learning how to draw a cube in one point perspective is a good starting place. Draw a horizon line. The horizon line is a horizontal line that will represent eye level in the scene. Place a vanishing point on the horizon line. The vanishing point is going to be the point at which we draw the box back towards (you’ll see in step 4). 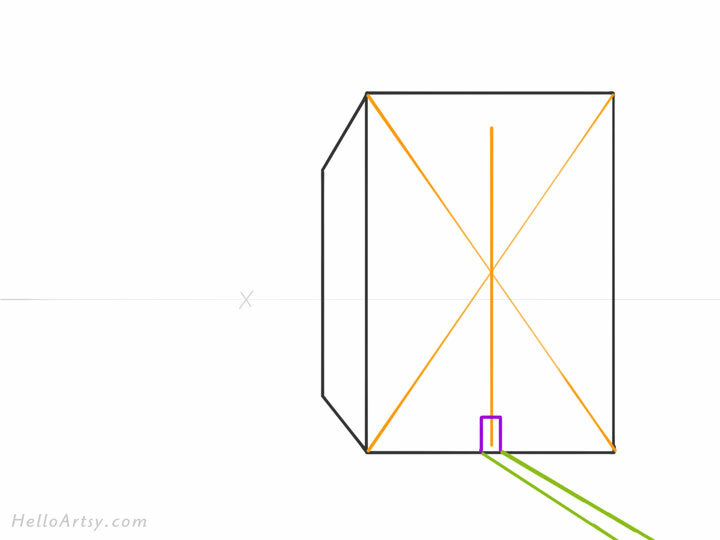 Draw the closest side of the box. This is a square shape. When learning to draw in perspective you’ll probably find it easiest to draw the front side first. This is nothing more than a flat rectangular shape! Notice in the drawing below the orange lines are perfectly vertical.  One can also see that the blue lines are perfectly horizontal. Connect the appropriate corners to the vanishing point. This is the magical part about perspective drawing. Creating these perspective lines automatically makes the drawing seem more real and three-dimensional! End the form. Nothing goes on forever. 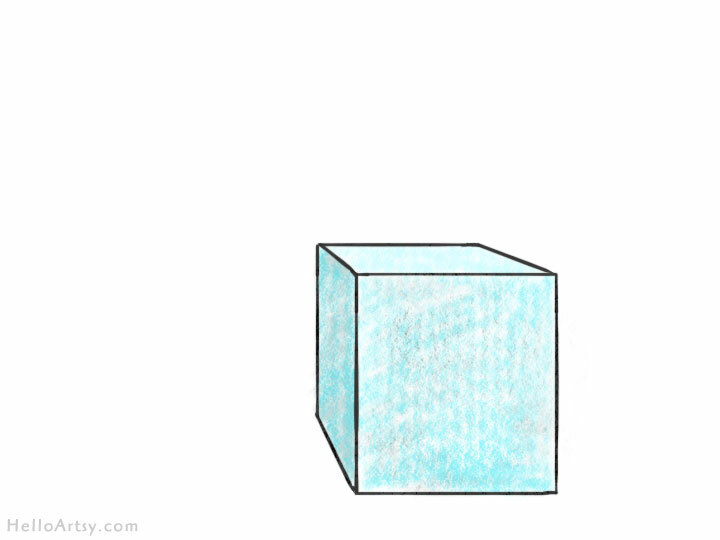 You need to pick a logical place to end the cube. Very Important – Notice how these final lines in the back are parallel to their coinciding lines in the front. 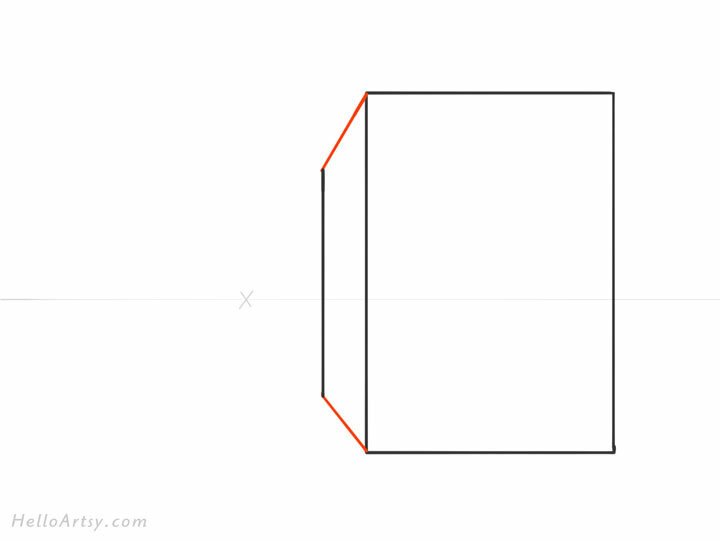 The verticals (orange) are vertical in both the front and rear of the box. 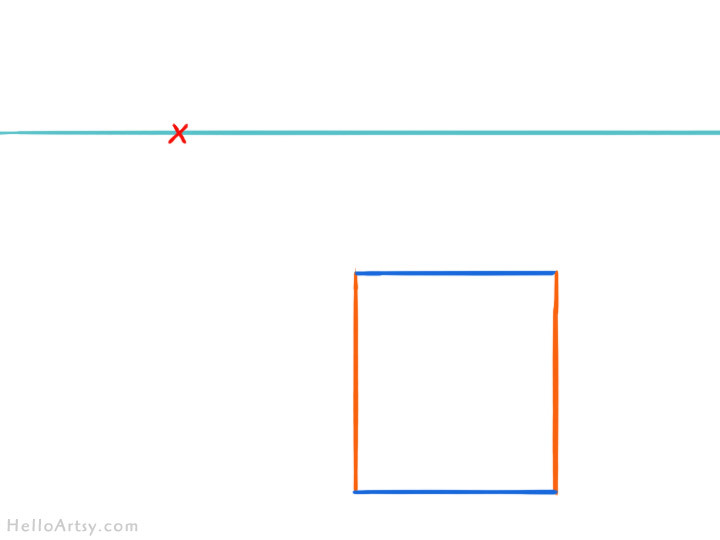 The horizontal lines (blue) are horizontal in both the front and the rear of the box. Clean up! When drawing in perspective you’re always going to end up with some extra lines or lines that are too long. You can draw all lines lightly first and then ink things later on when you’ve fixed up the drawing. Practice drawing various sized boxes in different positions around the paper. It’s important to draw each box to the same vanishing point. 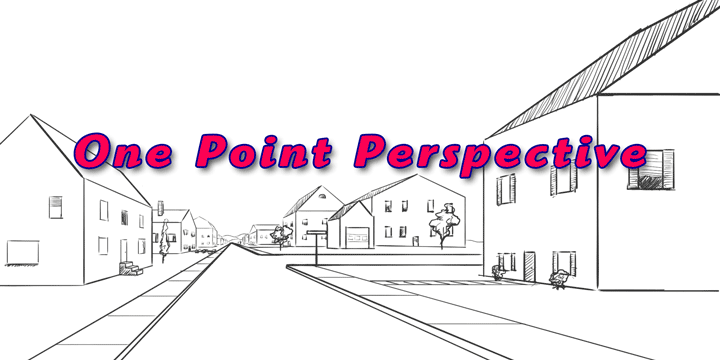 Remember: using a single vanishing point is how one point perspective earned its name! Once comfortable drawing cube-like forms to a single vanishing point you can easily apply the same technique to lettering. One point perspective will allow letters and words to pop out with a great looking, realistic 3D effect! Even if lettering is not your thing, pay close attention here. I’m going to use 3D letters as a tool for teaching you some really important one point perspective concepts. These concepts will later apply to drawing buildings, houses, rooms and tons more! Let’s start off with some simple letters that don’t have any curves and consist of only straight, horizontal and vertical lines. Remember the 6 steps used above to draw the cube? You can use that same process to draw a one point perspective letter. 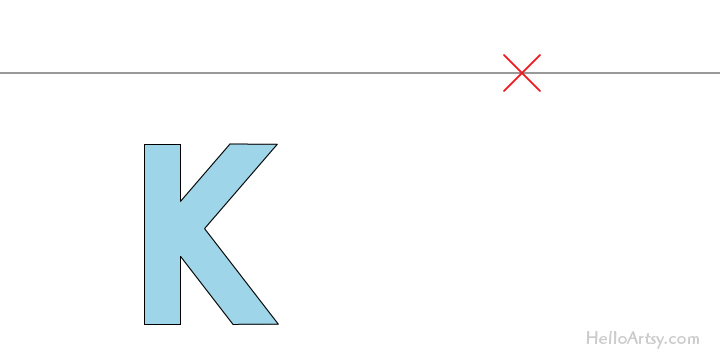 After drawing your horizon line and vanishing point, draw a simple block letter. Keep it simple. Think of the letter as simply rectangles joined together to form the letter. This drawing above will serve as the front facing plane of the 3D letter. Next, connect the letter’s corners to the vanishing point. Please observe that some of the corners were left out, as we wouldn’t see them in a solid (non-transparent) letter form. Also notice how the inside lines of the “H” stop when they extend beyond the (green) letter shape. Decide where to end the letter form. It’s important to pay attention to the angles in the original flat letter shape drawn in the front. 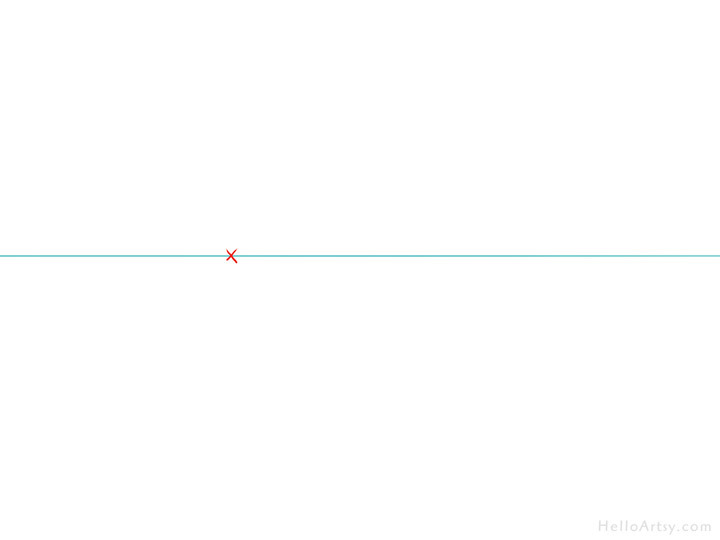 Notice how in the image above both the front and rear shapes that form the letter “H” line up perfectly with perspective lines. Pay particularly close attention to this aspect of a perspective drawing and you’ll avoid much confusion and drawing errors later on. Now the letter is complete. The letter “H” we just drew uses a single vanishing point and looks incredibly 3D. How awesome is that? 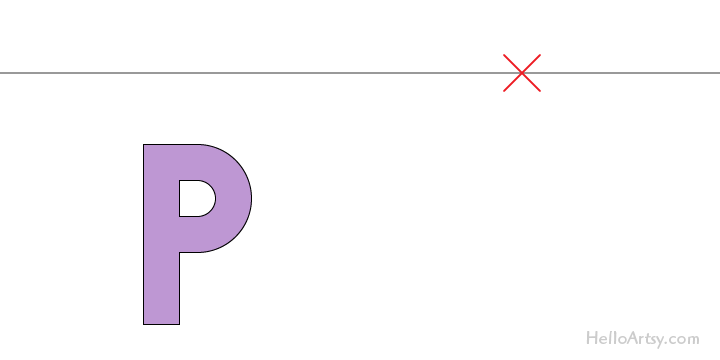 Even though most of the rear letter from the previous step was erased it was necessary to draw in order to accurately calculate the dimensions of this letter. Sometimes you need to draw the parts you can’t see to draw the parts you can! It’s worth pointing out the vertical and horizontal lines that are parallel to each other. A common mistake when learning to draw letters in perspective is to accidentally mess up this relationship. Compare your drawing to the diagram above and make sure you have the correct angles drawn. Want to practice drawing some perspective letters on your own? The next letters to try drawing are the ones that contain diagonal lines. Once turned into three-dimensional letters these types of letters will contain slanted planes. These letters such as “K”, “Y”, “Z”, etc… contain some non-perpendicular angles. 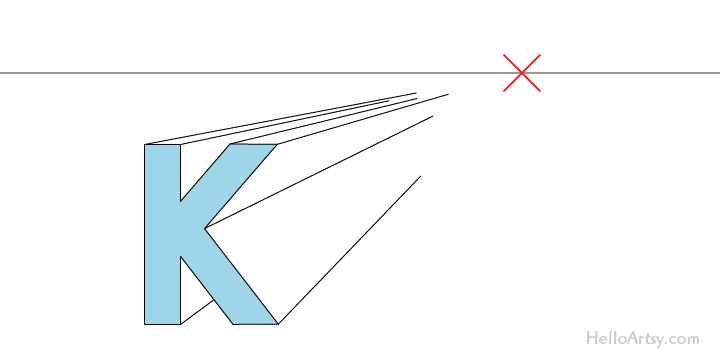 Let’s try drawing a letter “K” to get the hang of drawing slanted planes in proper perspective! A good place to start is with the front shape of the letter. In this case it’s nothing more than a simple letter “K”. Next, you draw all appropriate corners of the letter to the vanishing point. Make sure you use a ruler for this step or things will not line up properly in the next step. When ending the 3D letter in space remember to follow the front shape of the letter. In the diagram above you can see the blue lines are horizontally drawn and the orange lines are vertically drawn. Up next will be creating the slanted parts of the letter. 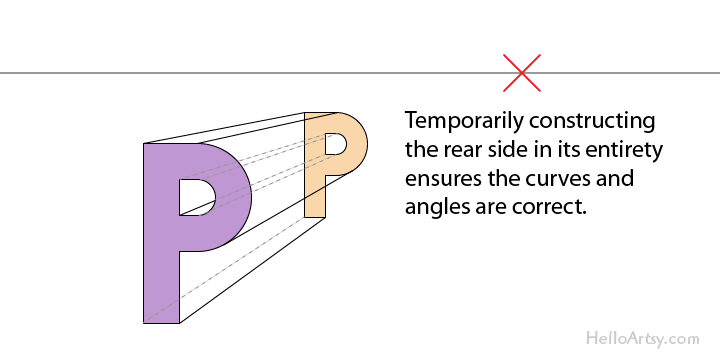 When dealing with slanted angles make sure the front and the back are parallel to each other. 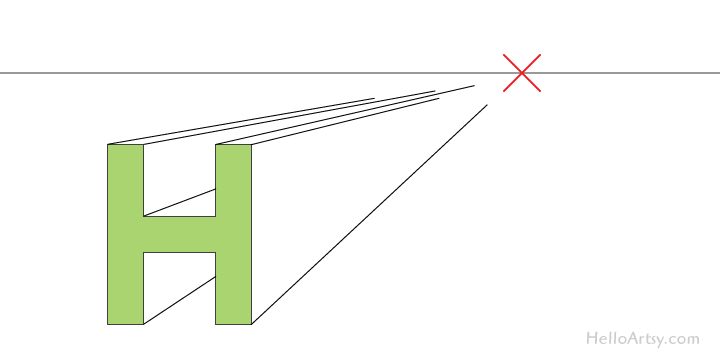 (see image above – slanted lines are drawn green). 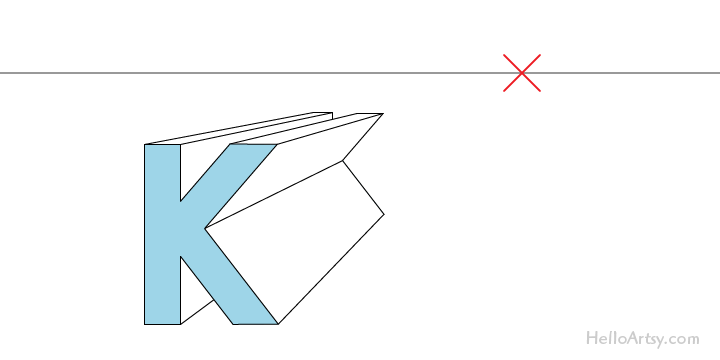 In the case of our letter “K” there are two distinct angles that make up the slanted part of the letter. Notice how the diagonal purple lines are parallel to each other. When learning to draw complicated forms in perspective, color coding your lines can help you make sense of which lines go where. Pay attention to the color coding above! Each set of colored lines represent lines that need to be parallel to each other. Finally we clean up the drawing a bit and we arrive at nicely drawn letter! At this point you might be thinking about drawing your name in one point perspective. I bet your name will have some complicated letters, letters with curves in them. Let’s figure out how to draw those curvy 3-D letters! First draw the letter as a simple flat shape. It’s helpful to imagine the curved part of the letter as a rectangle bent around into a circular shape. This way you’ll have a good looking letter to start with. 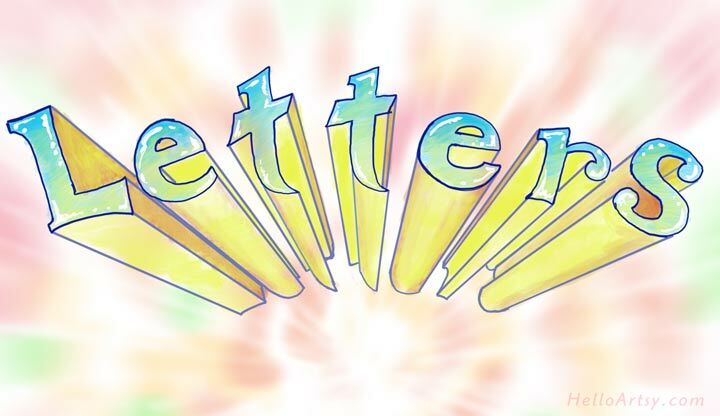 If you’ve been following along with the box drawing and the other perspective letters you know the next step is to connect the letter’s corners to the vanishing point. This is easy for most of the areas but can be a bit tricky to recognize near the rounded portions of the letter. We can consider the transition from the straight part of the line to the curved part of that line a corner too. As such we’ll be connecting that corner to the vanishing point too. Pay attention to this next part (shown above)… The challenge arises when you have some rounded portions in which we wouldn’t see the side of the letter. 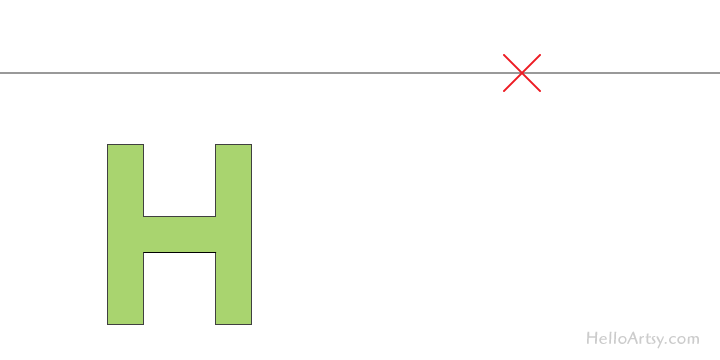 To calculate the position of your perspective lines, simply pivot the ruler from outside the letter towards the letter. 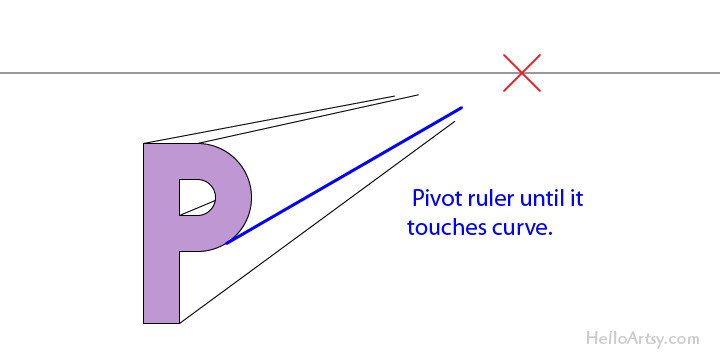 As soon as the ruler touches the curve, that is where you draw the perspective line. 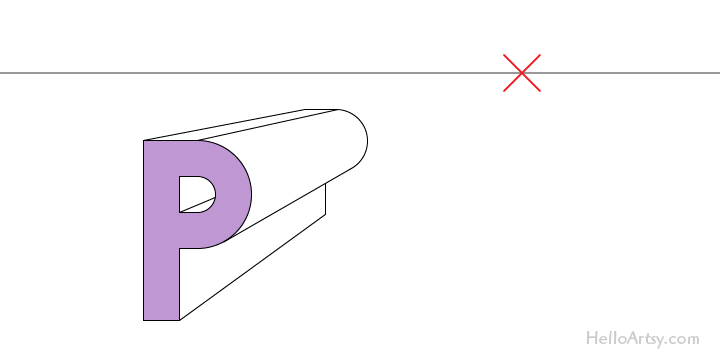 Image that blue line above was calculated by pivoting a ruler from the vanishing point and as soon as the ruler touched the rounded, outside portion of the letter “P” the ruler is held steady and the line is drawn! It’s often tricky to figure out what the rear parts of the curved letter would look like. Fortunately we can lightly draw the rear letter to help us figure this out! Study the image above. We’ll be doing this kind of thing often when drawing complicated objects in perspective! After cleaning up some of the temporary lines we are left with a 3D looking letter drawing in one point perspective! With the letter temporarily drawn, we can now emphasize the part we are actually trying to show. Practice drawing your name in perspective. Think about the angles and/or curves of each letter and take your time. Once you are proficient at drawing letters so they look three-dimensional a good next step would be to draw some one point perspective buildings. Much of what you learned so far will come in handy. 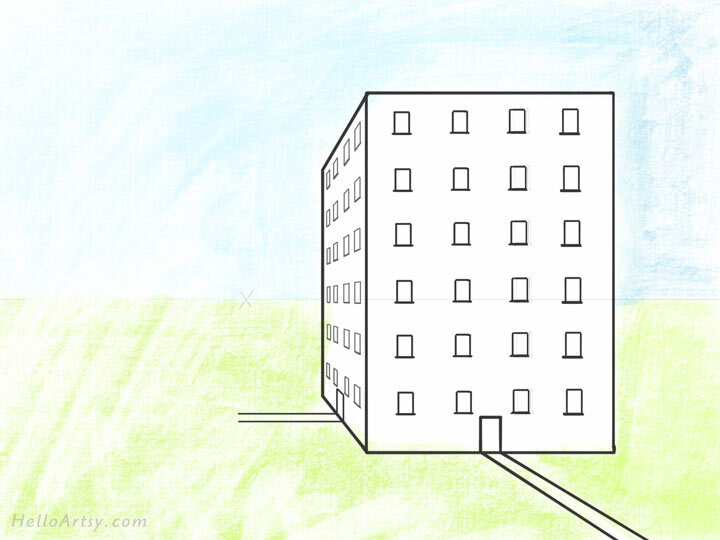 As an introduction to drawing exteriors, let’s draw a simple building. 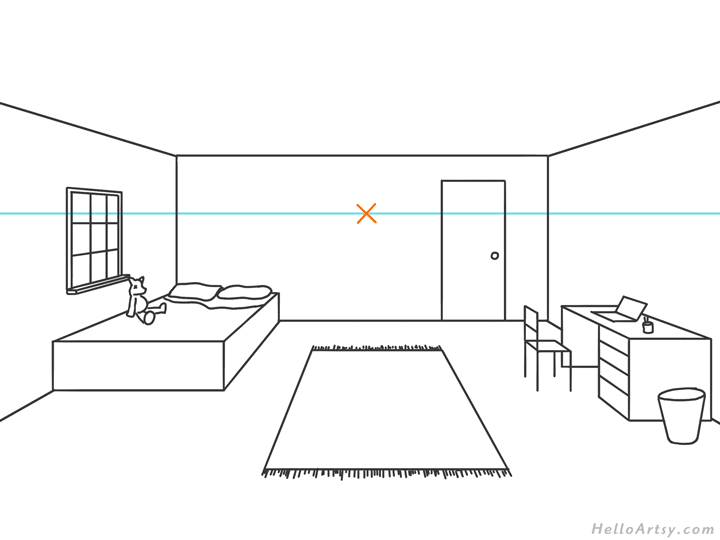 You’re going to discover some cool things about measuring within the one point perspective system! As always establish the horizon line and vanishing point. You’ll probably find it easiest if you draw the shape of the building’s frontal plane. In one point perspective this is simply a flat shape. The large rectangle above will serve as the front (closest) side of the building. When dealing with one point perspective architecture, most lines will be vertical or horizontal. The building is nothing more than a box. 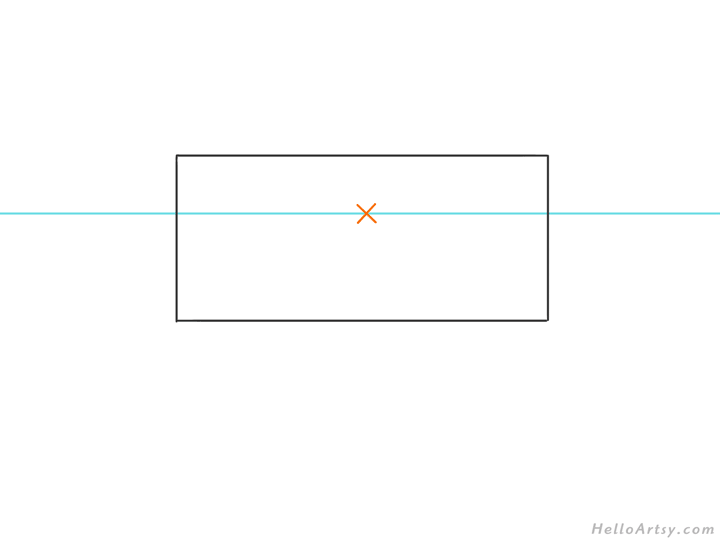 Connect the corners of the rectangle to the vanishing point and end the form with a vertical line. 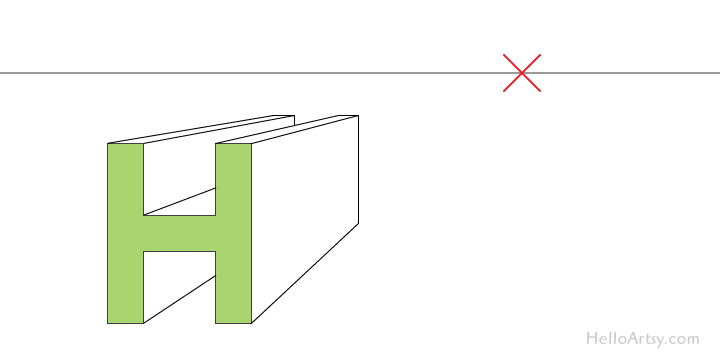 Note the perspective lines are drawn in red and are what gives the building depth. The building needs a door. 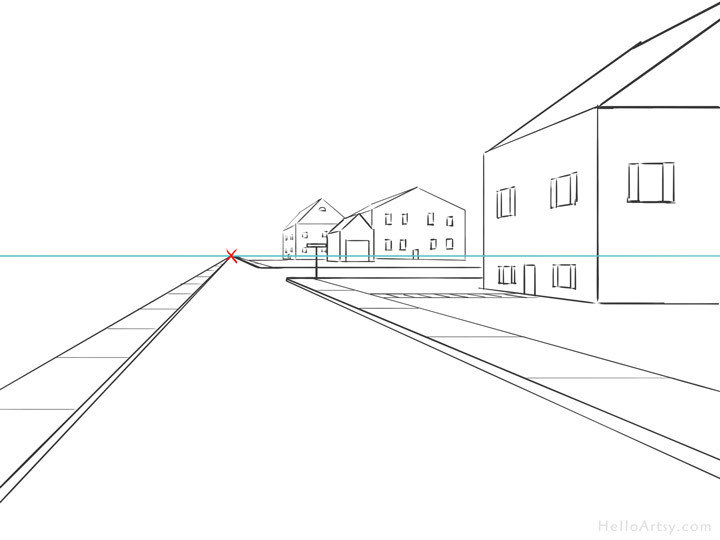 This is a great opportunity to learn about how to center things in a perspective drawing. 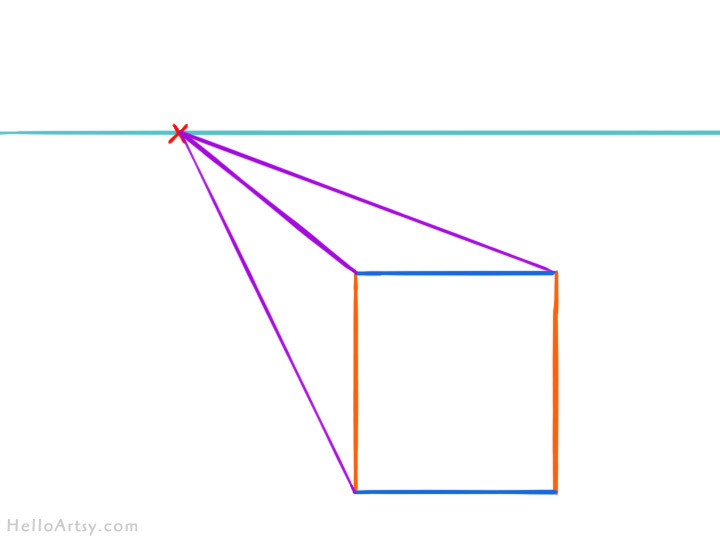 To find the middle of the rectangle, simply connect opposite corners. 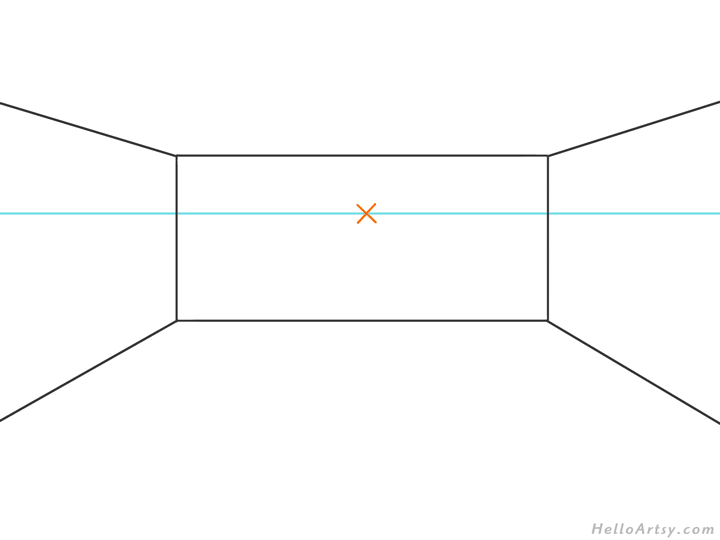 Once the middle of the rectangle (building wall) is determined, we can draw a vertical line straight through the intersection to get the two halves. With the middle of building marked, drawing the door is simple. We should probable draw a walkway too. Please note that the walkway consists of a pair perspective lines and must connect to the vanishing point. How about a door and a walkway on the receding side of the building? No problem. Check out the gray dotted line above. We can use that to help determine the appropriate height of the second door. Without that gray line(s) we would be guessing and our drawing would be prone to errors. Did you notice the orange “x”? Yep, we can also find the perspective middle of a box’s side using that same corner-to-corner technique. I love that! Just like we did with door, we can use the front windows to calculate the heights of the windows on the other side of the building. I am about to drop a whole box of perspective cleverness right on your head! Pick one row of windows and draw them in. Make sure they get smaller and closer together as they appear farther away. There are ways to calculate this logarithmic spacing but don’t worry about those fancy-schmancy techniques just yet – Just do it by eye. With one row of windows drawn in place you can extend each of their vertical lines through the perspective lines (gray dotted) we drew earlier. The intersections will be precisely where each window needs to be drawn. My my, if this was any easier this drawing would practically draw itself! You guessed, it… just draw those windows in. The vanishing point takes care of all the spacing. It’s almost magical how drawing to a simple point can make things look real. As always you’ll need to clean up your drawing a bit. Feeling confident? Try adding a street and a few more buildings. Heck, turn this into a one point perspective city if you’re felling ambitious! With the previously drawn building fresh in our minds we have really gained some cityscape perspective skills. Let’s keep this momentum moving forward and draw out an entire street scene using a single vanishing point! This is going to take more steps but you’re going to love it! Before we can draw the street and buildings we need to establish our horizon line (eye level) and vanishing point. By connecting perspective lines to the vanishing point we can create the illusion of a road bound by a pair of sidewalks. Let’s create a side street off of the main perspective road. Notice how the side street is drawn with horizontal lines. I’ve also drawn those control-crack thingee’s onto the top surfaces of each sidewalk. They too are horizontal lines and get closer together as they move farther away. Up next is our first building. This building will be a house with the typical slanted roof. You’ll probably find it easiest to draw the largest, closest buildings first. Afterwards you can gauge the appropriate size of each subsequent building as they recede from our viewpoint. We already covered slanted planes when we drew 3D letters near the top of this article. If you are confused, go check out the section on drawing slanted letters. To draw a door on this house we need to first find the perspective middle. This is, of course, the compensated middle do the diminishing size effects of linear perspective. Make sure your door is a realistic size. How many doors wide is a house? How many doors tall is a house? This type of thinking will prevent you from drawing doors that look unnaturally big for the architectural structure they adhere to. To include windows, draw the closest one first. Notice how the windows share the same set of perspective lines? This concept is pervasive throughout any type of linear perspective drawing. Just make sure to make the farther window smaller than the closer one. Add some more windows to make the house look convincing. Notice that no perspective was needed for the window on the front plane of the house. It’s just simple rectangles with no perspective at all! To draw a walkway leading to the house’s door, use a set of horizontal lines. The cracks in this walkway all connect to the vanishing point. Don’t get sloppy now… continue using your ruler! 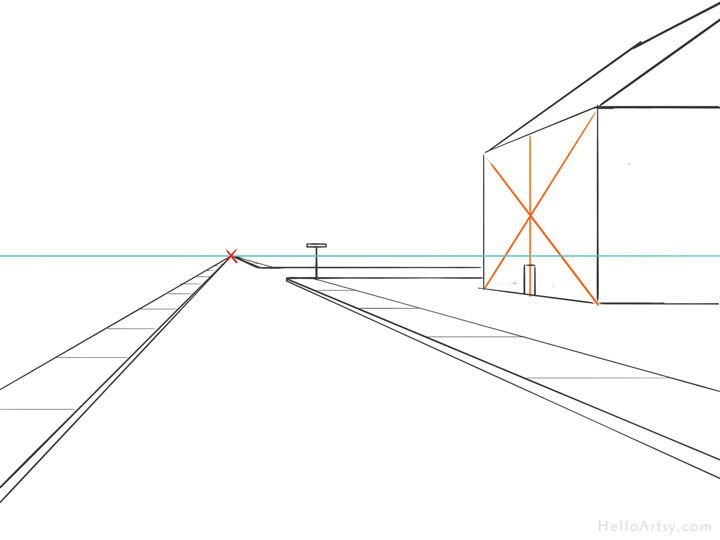 With the first house drawn in proper one point perspective we can move to the next farther house. While not all houses are the exact same size it would be wise to use the perspective lines of the first house to give us an idea of the proper size of the next house. And onward we go! Here’s yet another house. At this distance we can minimize the amount of details we choose to include. With the right side of the road drawn in with all kinds of houses and architectural buildings we need to start on the left side of the road. This is very much the same process as earlier. For some added interest we can ad a set of stairs leading up to this house’s front door! Below in the advanced section I demonstrate how to draw stairs. Just like before we can add some windows to this house. Now let’s change things up slightly and draw this next house facing the other way! Variety can become important in a work of art. 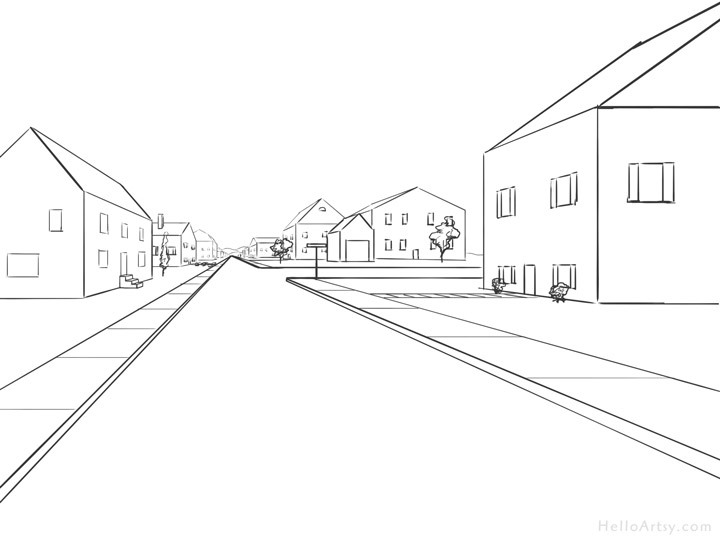 And on and on we draw… finish up the left side of the perspective street with as many houses we can reasonably fit. Perspective drawings can get a bit boring if everything is a straight line. Besides, the neighborhood we just created is in need of some foliage. We can dress up our perspective drawing by hand drawing some trees and bushes. Just keep in mind that they get smaller and less detailed the farther they are from us. A good final addition to any perspective scene is the use of some basic hatching or crosshatching. It will add some values, texture and shading to our marvelous street scene! So far we’ve primarily been focused on how to draw the exterior of forms. But what about an interior? Let’s examine how to draw the inside of a room in proper one point perspective. 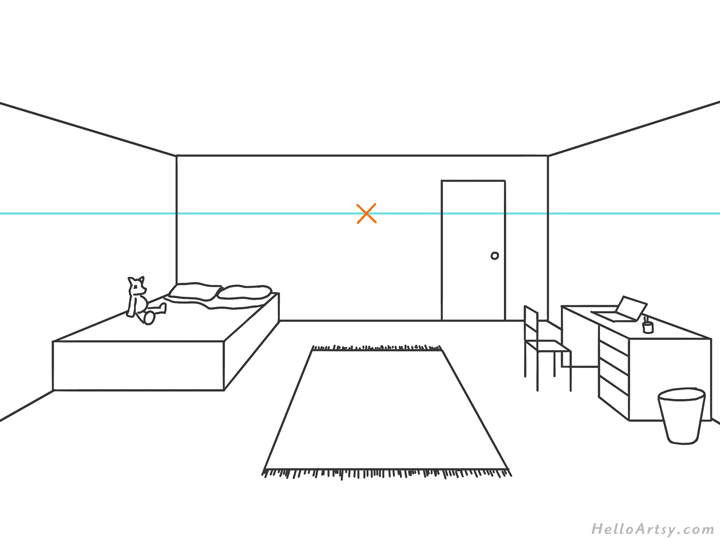 If you just jumped to this section hoping to learn how to draw a room in perspective, please review some of the techniques we used above. The section on drawing letters and the section on drawing a single building are full of useful information you can apply to a room drawing. One of the easiest ways to draw a room is to construct the empty “shell” of the room and then to place all of the room items inside. While there’s many ways one can go about this, I think it’s easiest to draw the back wall first go from there. 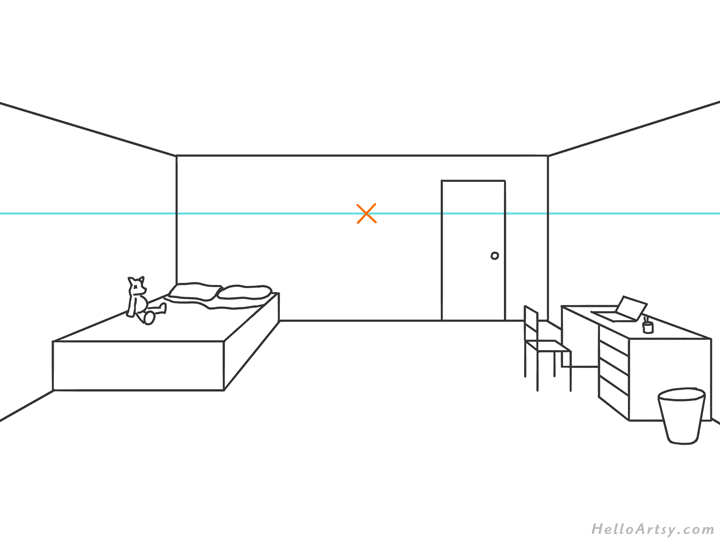 When drawing interiors using the one point perspective method it’s best to draw the far facing wall first. This is nothing more than a rectangular shape. 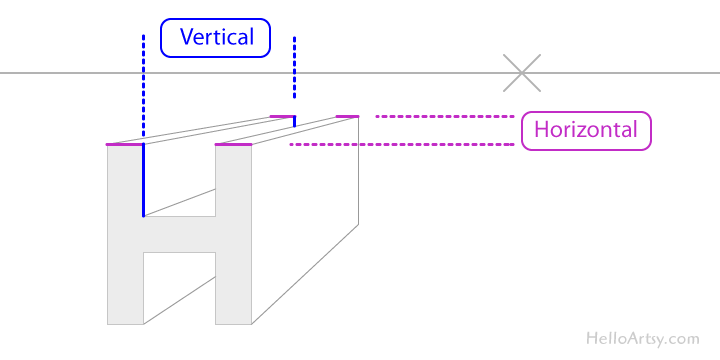 The proper height of the horizon line and position of the vanishing point can be calculated after the far facing wall (rectangle) is drawn. The horizon line (eye level) will determine from what height our viewers of the illustration are at. The drawing above has a horizon line positioned for somebody standing and looking across the room. 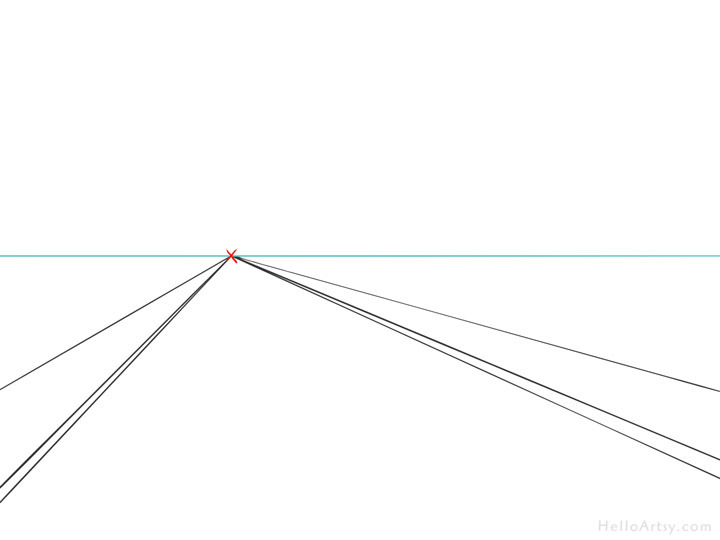 After you’ve determined and drawn your horizon line, place a vanishing point somewhere on the line. Visually, the vanishing point is the point on the far facing wall that is directly in front of you. 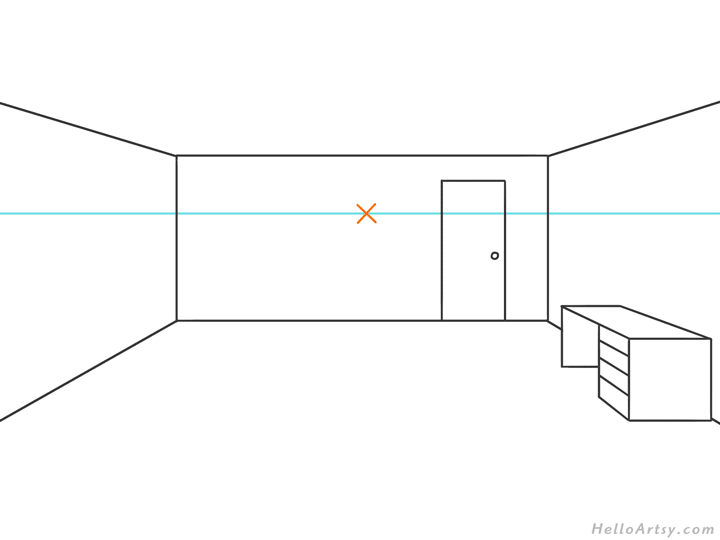 In the example above this room drawing will look as if we are standing central to the back wall and looking straight at it. Now connect the corners of the far facing wall (rectangle) to the vanishing point! The dotted lines are there just to show you that these perspective lines that make up the room’s side-walls are indeed drawn to the vanishing point. 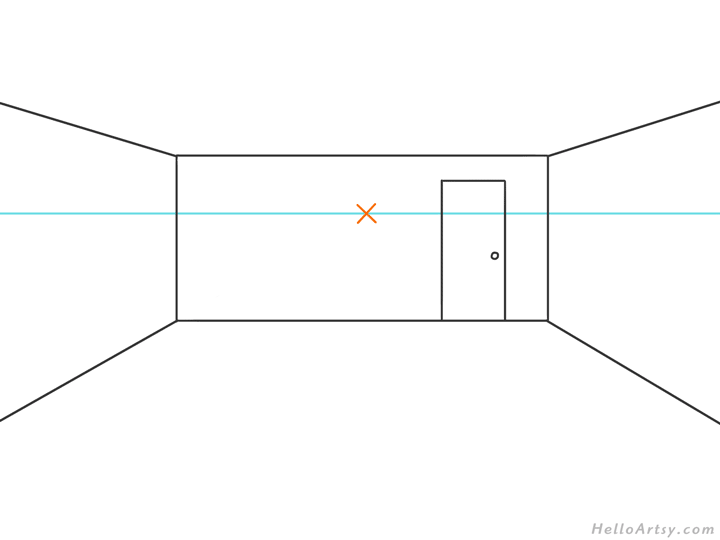 We only need the lines drawn from the rectangle (wall) outward… like in the example below. Cool huh? We’ve created an empty box that we appear to be inside of! Drawing interiors can be easy if we just take things one step at a time. With the room empty but 3D looking we can start adding some of the bedroom elements to this empty box / room. 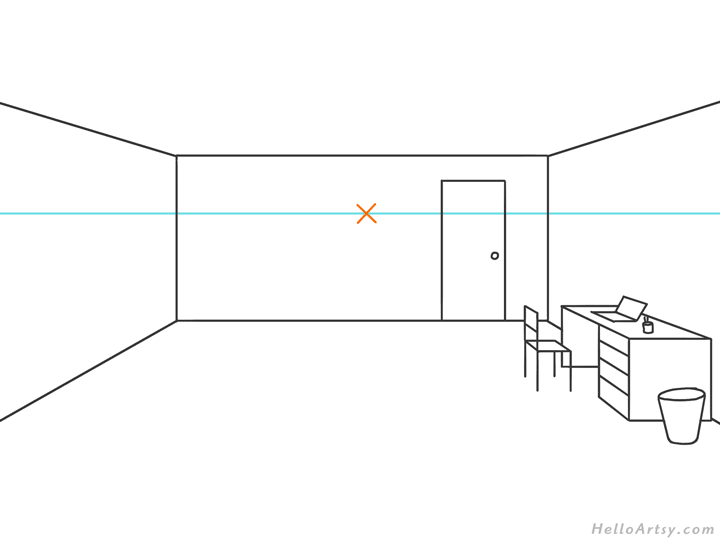 Drawing a door on the back-facing wall is nothing more than a flat rectangle. There really isn’t any perspective involved in this part of the drawing. In the drawing above we’ve drawn a desk. Notice that the desk is box-like and connects to the vanishing point. If you’ve completed all of the perspective drawing exercises on this page this should be easy for you at this point! I don’t anybody’s bedroom that contains an empty desk so let’s add some detail to the desk area of the drawing. Notice that the laptop and the chair are also drawn to the vanishing point. This wouldn’t be a very effective bedroom scene if we didn’t include the bed. Remember to keep things simple. A bed is nothing more than a box-like form and can be drawn effortlessly if we connect it to the vanishing point. The quickest way to make a boring looking perspective drawing is to only include the ruler drawn architecture and not include some appropriate hand-drawn elements. As such I added some pillows, sheets, and a teddy bear for good measure! This is starting to look like a friendly, lived-in room! If you want to draw a rug on the floor of the bedroom just remember that it also get’s connected to the vanishing point. Finally we get the chance to add a window on the left side. You’ll notice that the window sill is a very thin, long box. Also notice that the lines that break up the window’s panes adhere to perspective rules: each section gets smaller as in recedes farther away. Of course no bedroom would be complete without some cool looking posters. 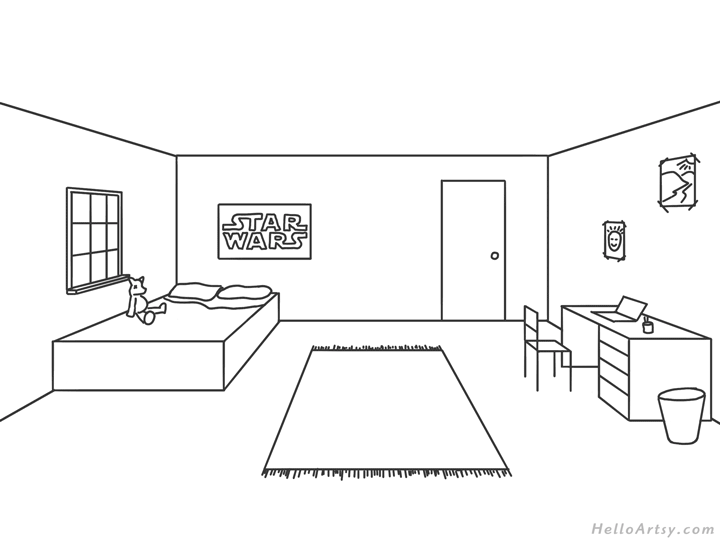 The “Star Wars” poster hanging on the back wall is flat and contains no perspective. The posters on the right wall, however have to be drawn to the vanishing point. While the horizon line and vanishing point is necessary for the drawing process, it really shouldn’t be included in your final drawing. Even though one point perspective is considered by most artists to be elementary there are things one can do to elevate the level of one’s drawing. When it comes to perspective drawing there is a seemingly endless array of techniques to arrive at clever solutions for accurately rendering our 3-D world on paper. Since this entire page still has perspective drawing beginners at heart I will keep even these complex drawing problems as simple as possible. Check back later. I’ll be adding links to more pages that contain extremely meticulous steps to complex one point perspective problems. 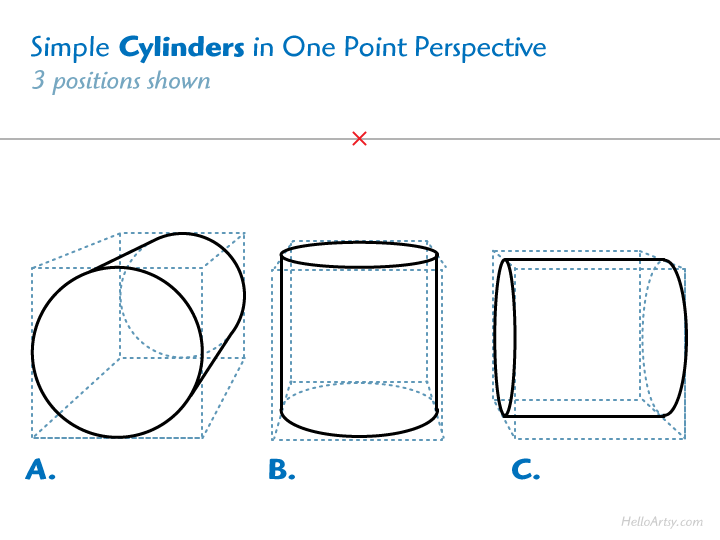 Position A. of the cylinder is drawn with an undistorted circle. Position B. of the cylinder is drawn with horizontal ellipses. Position C. of the cylinder is drawn with vertical ellipses. Notice how the ellipse becomes taller and more circular the farther it moves away from eye level (horizon line). 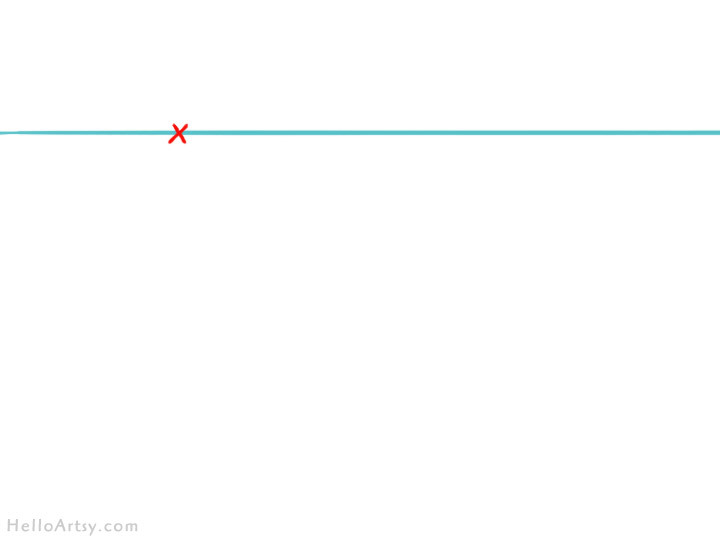 At eye level an ellipse is a horizontal line! 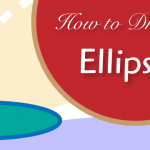 This principle of changing ellipses also applies to the vertical ellipses in our perspective drawings. The farther an ellipse moves away from the vanishing point (left or right) the wider and more circular the ellipses become. 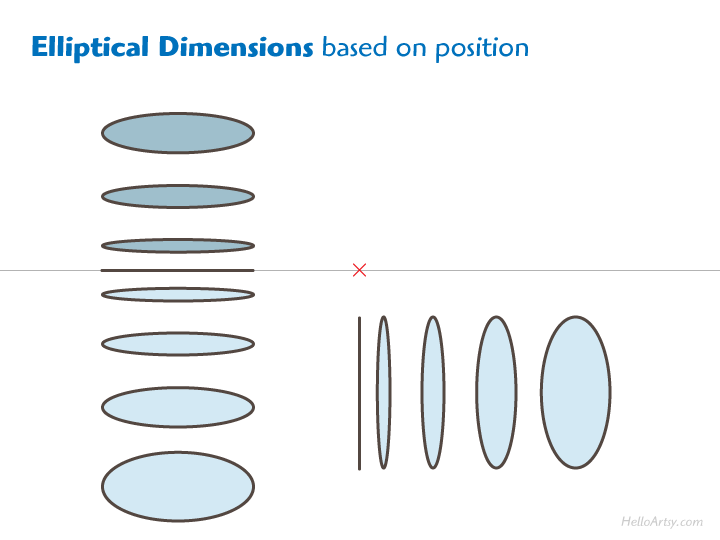 Did you know, there’s a great way to calculate these circles in proper perspective? Construct things out of boxes first. It’s easy to draw a convincing box first. 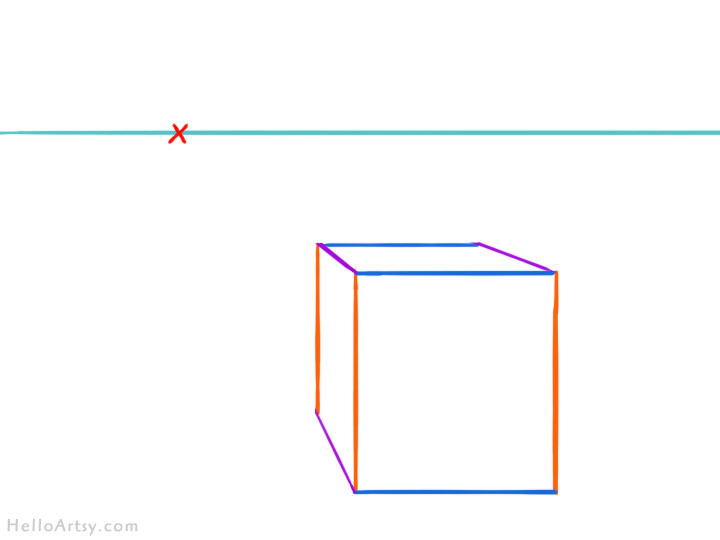 Then you simply confine the ellipse to one or more of the box’s planes. That’s precisely what I did in the “Simple Cylinders in One Point Perspective” diagram above. The dotted lines show the box that holds the cylinder. 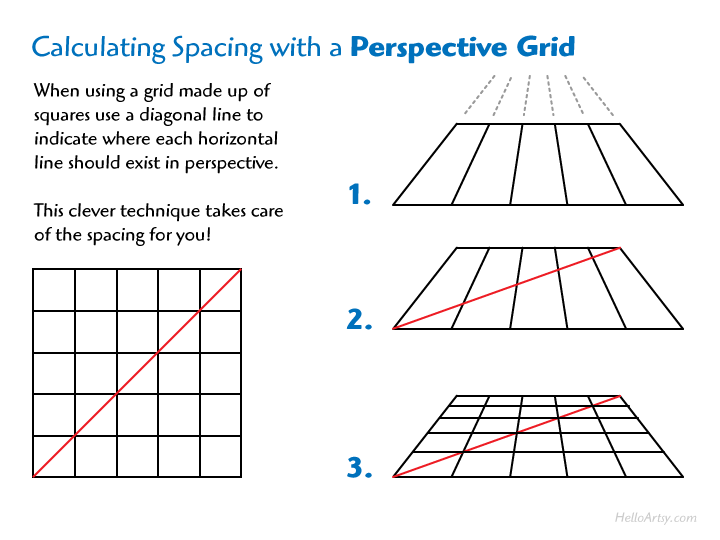 Almost every perspective drawing problem can be solved by using a perspective grid. Anytime you have a complicated shape or form that needs to be drawn in perspective you can draw a plane first. the plane should be an “envelope” that marks off the shape/object’s bounds. Next you can implement a grid inside that plane. If you grid out a plane on both a non perspective view and a perspective view you will be able to map things over. This is what the drawing below is demonstrating. Normally drawing something like this word “GRID” would be really difficult to comprehend. How it would look foreshortened in perspective is tricky to gauge. 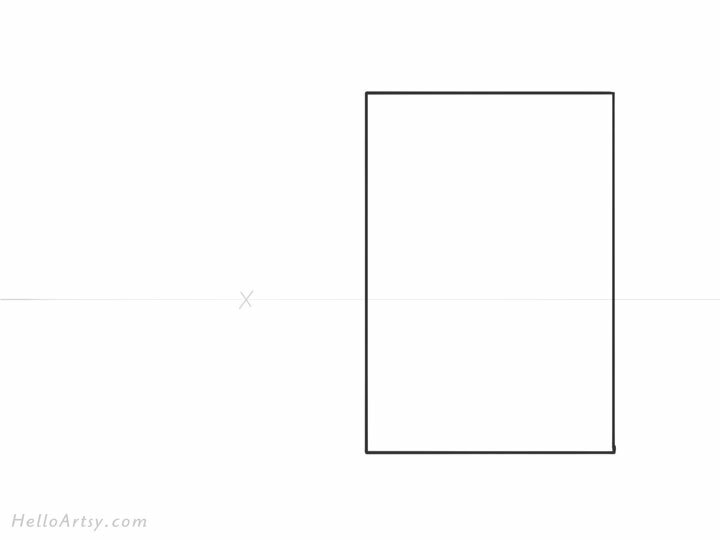 Look how much easier it is to draw with the help of a perspective grid! Did I mention that perspective grids are handy? A pyramid has a flat (polygon) base and triangular sides meeting at an apex. 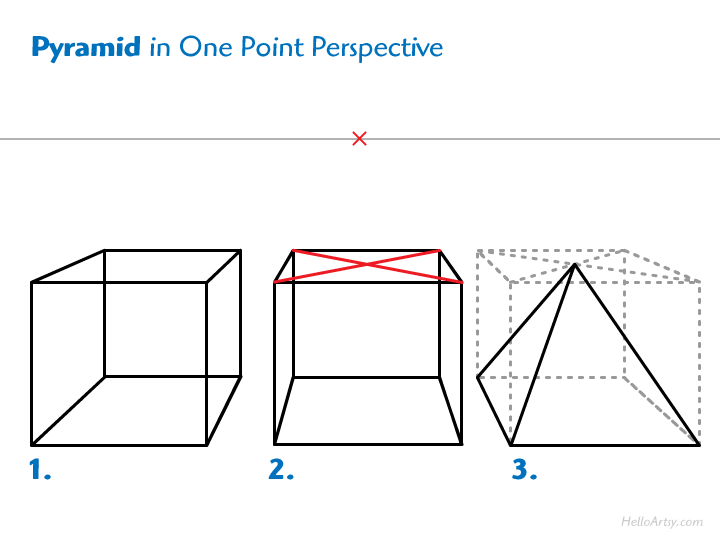 The need to draw a pyramid in perspective arises occasionally when drawing architecture. A cupola on a barn comes to mind. Staircases are nothing more than a series of boxes. There are indeed some very complicated formulas for rendering staircases but this entire page is aimed at beginners. A very simple way to draw stairs in one point perspective is to draw a series of boxes. Each box gets taller than the previous one as the stairs progress upward. Just make sure that each step is drawn smaller in size as it recedes away from us! 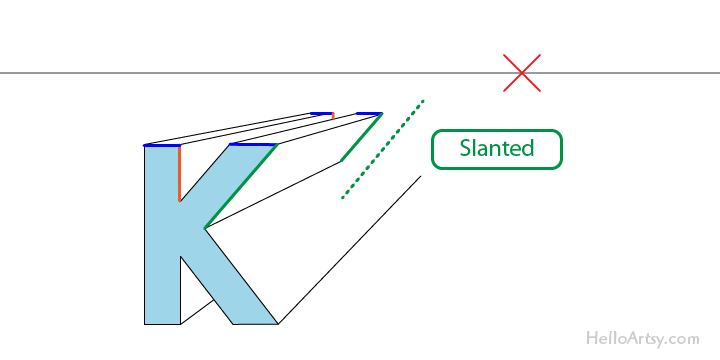 In one point perspective slanted planes end up having parallel lines that make up the front slant and the rear slant. It’s usually simple enough to place the slant by eye which is precisely what you can do much of the time. Also worth noting is how we can use a little bit of geometry to calculate the matching slants for us. The diagrams below show how we can complete the box to help calculate the finishing line for the slanted plane. Even though we want a wedge shape, drawing the complete box in perspective first helps us out big time! Need a solution to a one point perspective drawing? Make a comment below. Hi dear, loved the way you have explained everything here..
Keep it up, it was very helpful . This is an absolutely a perfect site for people who want to learn perspective. Great explanation along with easy to follow reference! Thanks a lot John. This is great! Thanks Bob, I’m glad you found the lesson useful! Wow, just perfect. you have explained things in simpler terms that was beautiful. Yay that’s really awesome, thanks! 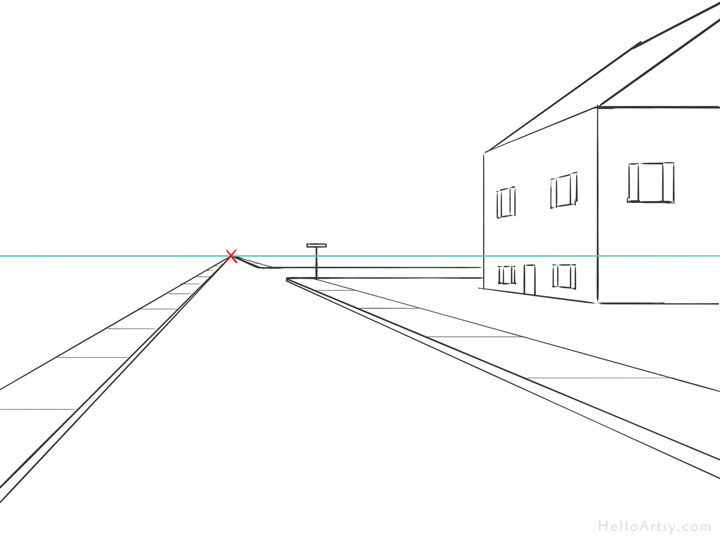 If people are walking into the distance and their heads are therefore on my eye level line, does the vanishing point at the end of a one point perspective road that they are on have to be on this line ? In short, yes. But in real life roads are rarely perfectly flat, straight and level. I’m stumped as to how to draw the bricks on a road that does not go straight and disappears in the distance. I thought I would use 2 pts. Then I saw the grid explanation. But which would be the one I use? 2 pt or grid? Decide whether the drawing should be in one-point or two-point and then create a grid based on that form of perspective. Note if the bricks are angled like a diagonal herringbone pattern they like anything not perpendicular to the subject matter would go to it’s own unique point(s). This is all very hard to describe in just words. Thanks. Sounds like it will be hard, but I’m going to work on it. That is fantastic Karthika! Thanks for your comment! I don’t know if you’ll answer, but I’m wondering how to draw tilted object in a one point (and two point) drawing. 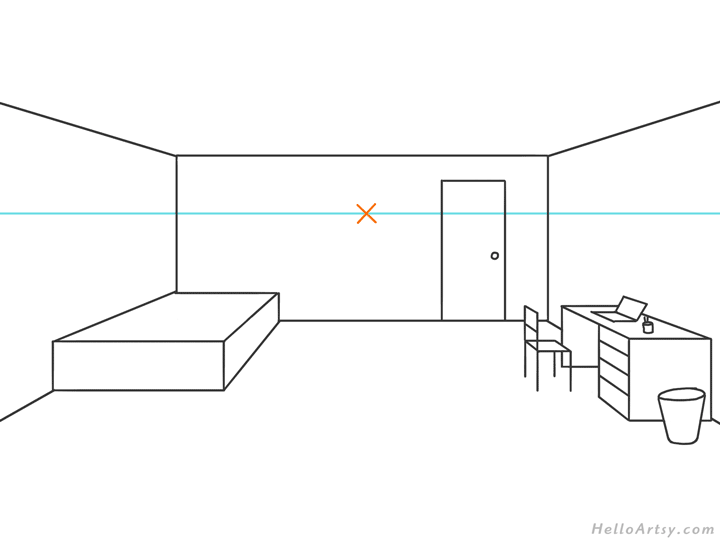 For example, when you drew the bedroom, if I want the bed to be tilted by a 20° angle, how could I do ? If I want to draw sheets of paper on the desk, how can I draw them so them seems to be on the desk, and not floating ? For tilted objects start with letters like this: http://helloartsy.com/one-point-perspective/#letters-with-diagonal-angles-slanted-planes Draw a bunch of slanted planes in letters and it will start to make sense to you. To anything so it isn’t floating drawing object from the ground up. Hi, a big thanks for your rapid answer! 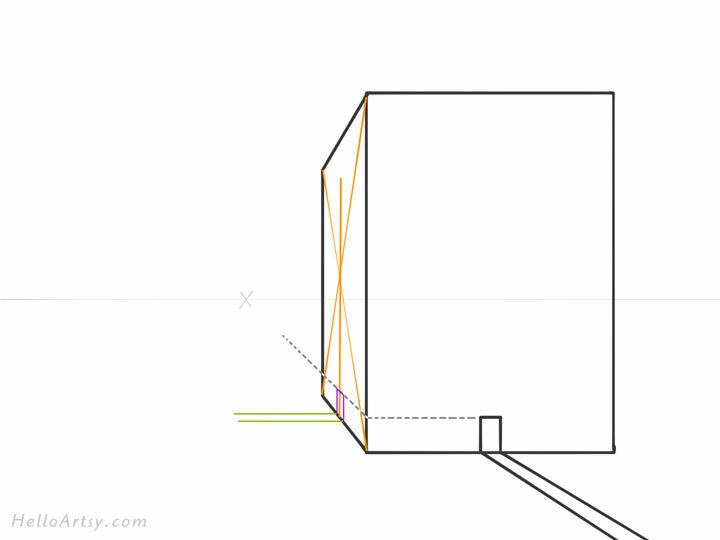 I try to draw a box, and then to draw a rotated box inside, using the vanishing point but.. It seems completely off. Anything rotated technically goes to it’s own vanishing point. 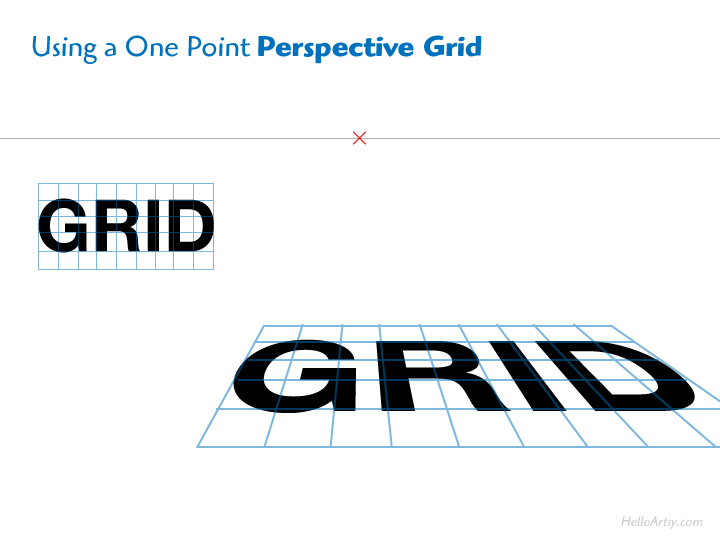 Take a look at the perspective grid example I provide where I draw out the word “grid” in one-point perspective. You can use that to get started. Omg is that correct John morfis?!?!?!??!?? me love art so me gonna reply to yor answer becauz me is så hapy hello im u biggest fan!!!! I teach in a one-room school of 20 kids. I am not an artist, but enjoy bringing ideas to my kids beyond the crafty trinkets they will toss out. Your site will be my Bible this month as I try to share the drawing bug with them. Thanks for making it doable. Please make more! That’s fantastic. Thank you Robert and good luck. I hate to say it, but circles in perspective are not ellipses! 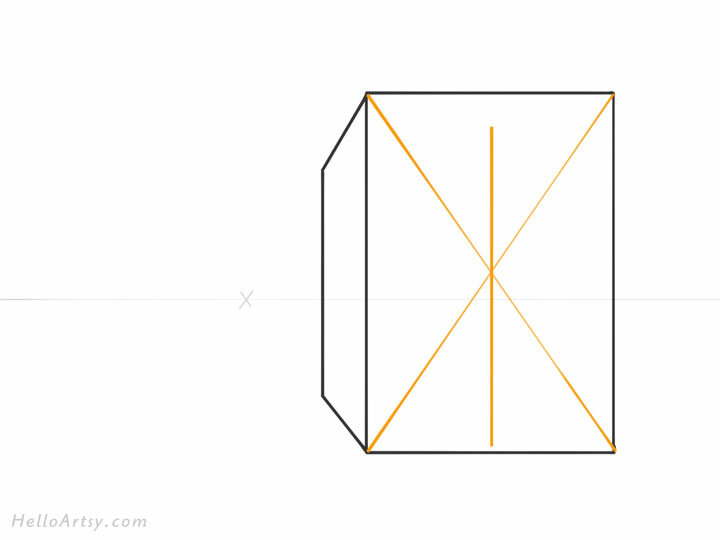 If one draws the diagonals each side of a cube, you will find the center in perspective (the intersection point of the diagonals) receding just like any other point on a line. And the center of the circle is no longer in the center of the cube even though if drawn properly it remains in the “apparent” center. I can lay it out better than describe it! You’re right, however this perspective tutorial is aimed at beginners. It’s important for beginners to gain small wins and not get caught up in minor details that give only marginally better results. Since this entire page still has perspective drawing beginners at heart I will keep even these complex drawing problems as simple as possible. Since you can “lay it out better than describe it!” feel free to draw up the lessons graphically and send us the links or email me the files for inclusion here. Use a vector drawing application for the cleanest results. Check my youtube channel. I have one on one point perspective. I have done the perspectives along sides , is it possible learning perspective help learn to draw anything including the human body or a drawing period? Although you probably wouldn’t use precise, straight lines going to a vanishing point to draw a human body, an understanding of perspective concepts will help you draw everything… including the human body. 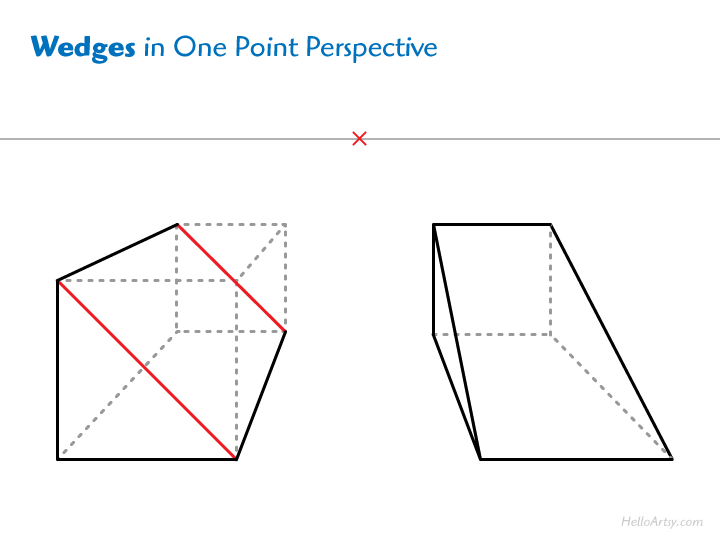 Understanding perspective gives you an understanding for drawing 3D space.